May's selection is the second time I have chosen music from the Sami lands of northern Scandinavia. 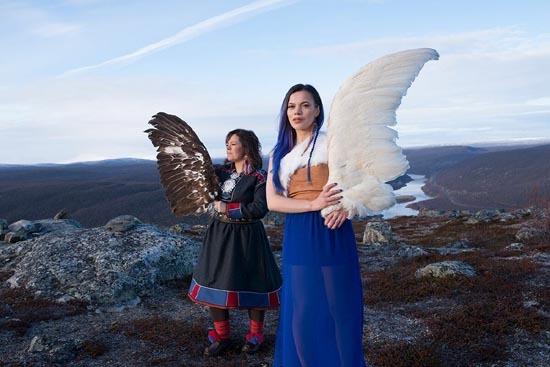 This time around, it is a mother and daughter singing and joiking team of Ulla Pirttijärvi-Länsman and her daughter, Hildá Länsman, calling themselves Solju. Ulla Pirttijärvi is familiar to many who follow the music of this part of the world, having forged a long career in both folk and art music circles, bringing the voice of the Sapmi people to the world. Her daughter adds a more contemporary voice to the mix on this new album, Odda Áigodat (New Times), where they are also joined on some tracks by throat singers, percussionists, cello, bass and some keyboards, and members of the Czech National Symphony Orchestra. At the heart of it is always the sound of the unique and mesmerizing vocal technique called joik and songs in the Sapmi language. They present raw, primal folk music, gorgeous folk songs and some outer-fringe new sounds throughout the recording. These recordings were donated by the artists and Bafe's Factory, so your subscription and purchase all goes to support the magazine and radio programs. We thank them all for their generous support.